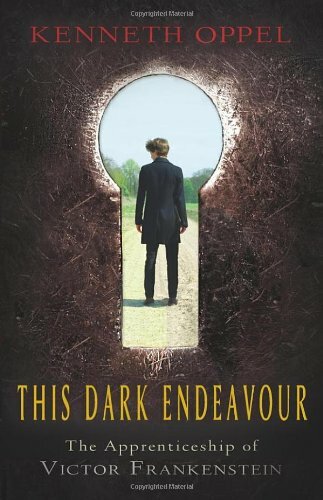 Kenneth Oppel’s novel This Dark Endeavour was a finalist for Canada’s Governor General’s Literary Awards and it’s no wonder. It’s a terrific book. We’ve been talking about it at school recently as several of my colleagues have read it and think it would make a great addition to the classroom. I agree. The language of the novel is almost old-fashioned, but the action will appeal to boys and the elements of romance will appeal to girls (or vice-versa) making This Dark Endeavour the perfect gateway drug to introduce students to classic novels like, well, Frankenstein. Sixteen – year – old Victor Frankstein lives with his twin brother, Konrad, younger siblings and parents in a chateau in Bellerive on Lake Geneva. They also share their home with their cousin, Elizabeth. Their friend Henry also spends a great deal of time at the chateau. They four teenagers spend their time riding, boating, studying and exploring the centuries old chateau. When the young people are discovered by Konrad and Victor’s father he says, “You’ve discovered the Biblioteka Obscura I see.” Mr. Frankenstein is a local magistrate, a powerful and intelligent man who encourages his children’s intellectual pursuits but is none too happy about their discovery of this Dark Library. You must understand that these books were written centuries ago. They are primitive attempts to explain the world. There are some shards of learning in them, but compared to our modern knowledge they are like childish dreams….This is not knowledge….It is a corruption of knowledge and these books are not to be read. But when Konrad falls seriously ill, Victor returns to the Dark Library looking for a cure and This Dark Endeavour ramps up the fun. Victor, Elizabeth and Henry try to gather the ingredients for the Elixir of Life in the hopes that its mystical properties will restore Konrad’s good health and their quest is what propels the plot forward. It’s exciting and dangerous work, but Victor is a character readers will easily root for – even though he is hot-tempered and sometimes struggles to do the right thing – especially where it concerns Elizabeth. Careful readers will spot some of the literary shout-outs embedded in the novel. For example, Victor seeks the help of Dr. Polidori who was, in fact, a real physician and writer ( 1795 – 1821), consort of Lord Byron and credited with writing the first vampire story, “The Vampyre.” Dr. Polidori lives on Wollstonekraft Alley. Fans of Mary Shelley’s novel Frankenstein might recognize Wollstonekraft as Shelley’s mother’s name. Wollstonekraft (1759 – 1797) was a writer and feminist, well-known for her work A Vindication of the Rights of Women. It’s references like these which would make This Dark Endeavour such a great book for the classroom. This entry was posted in Uncategorized and tagged 2013, Book Review, teen, YA by Christie. Bookmark the permalink.